In order to prepare ingots of steel for shaping into finished shapes, the roughing mill rolls it to a shape that is roughly similar to the finished shape it will eventually have. The most common of these rough shapes are slabs, blooms and billets. Slabs are made by rolling the ingot to make it thinner and longer; while thinner than the ingot, slabs are usually still several inches thick. Further rolling in the finishing mill will thin them further, into steel plate or thin sheet. Blooms are made by rolling the ingot to make it thinner, narrower and longer. An 8-inch high by 8-inch wide bloom may be rolled and shaped in the finishing mill to produce rails for railroad use. Billets are similar to blooms in shape, but are smaller in height and width. They are often cut to keep their length manageable, since they will need to be transported to the finishing mill, where they may be rolled into bars and rods of various descriptions. 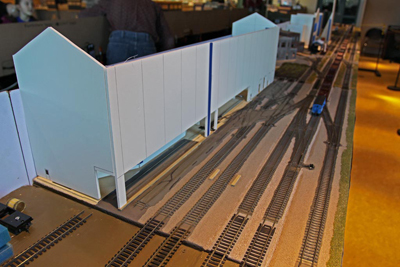 The mill building modeled here is compressed to fit on the model railroad display - the model is only four feet long, but if modeled to prototypical size, would be 20 to 40 feet long, and 3 to 5 feet wide - which would be far too large to be taken to a show. 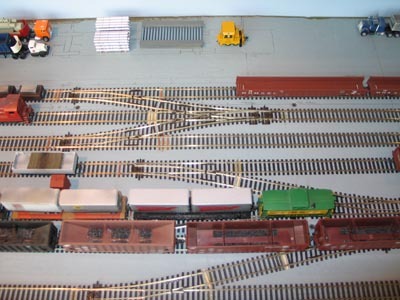 An overhead view of the roughing mill module, with track complete, but very little scenery in place. 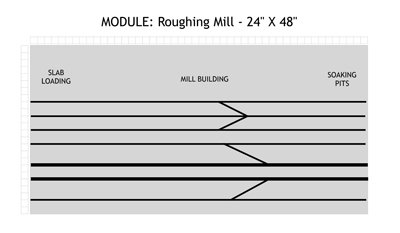 The roughing mill building mocked-up in foam core board. This allows changes to be made in the structure plan before the final structure is completed.